With typical panache and imagination, Artizani and Avanti Display collaborate on a new walkabout performance and installation. 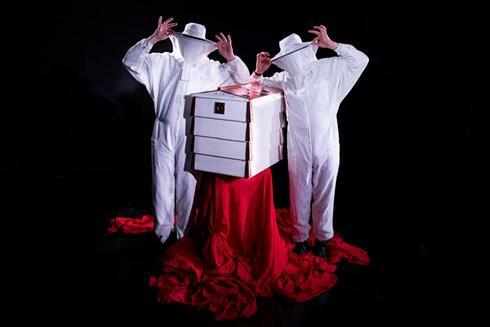 A multi-sensory experience in which audiences get up close and personal with our deluxe and sumptuous beehives. 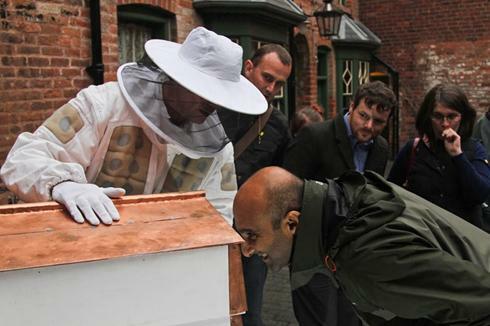 In a secular ritual the hive is processed shoulder high by two devotees of the esteemed bee. Once set down and consecrated, step forward: Hear the BEE! Feel the Bee! Smell the Bee! Taste the Bee! And if you dare, put your eye up to the hive and See the Bee! With a hilarious sting in the tail this is a miniature installation with a huge visual impact. Also available, part of Arts Council England’s commission of 6 Impossible Things, an installation of six hives all hiding a unique interior world. The hives are tended by our ethereal beekeepers and kept passive by clouds of smoke, colourfully lit at night. Each hive contains a surreally imagined aspect of the secret life of Bees, such as the bee cinema – did you know bees were massive fans of Spaghetti Westerns? Audiences wander amongst the Colony, occasionally cloaked in smoke, finding a variety ways of viewing and interacting with the contents. In each there is a surprising conceptual twist, which challenges, charms and confounds expectations – you may find yourself looking into the vastness of space, or teased by a telescopic hive soaring into the air. There is also potential for additional commissioned hives or workshops leading up to festivals in which groups or artists would create their own hive/s in collaboration with us.